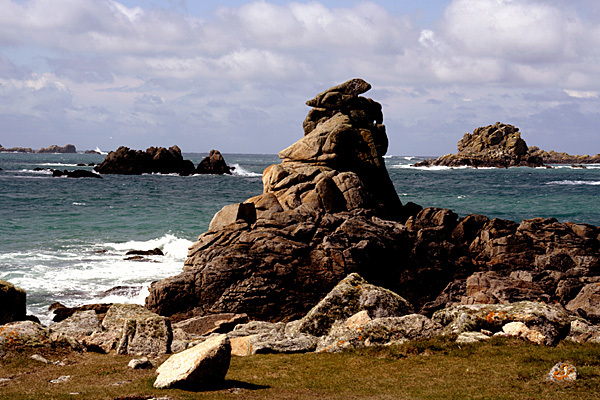 A granite tor on the rocky shore of Bryher, looking out towards the Norrard Rocks. 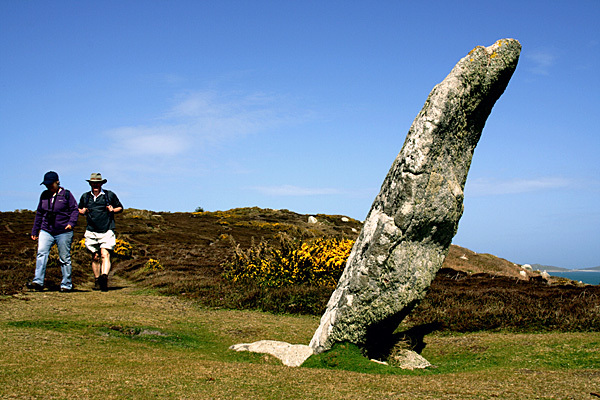 Walkers approach the Old Man of Gugh, a standing stone on the little island of Gugh. 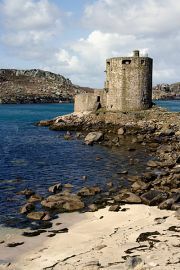 Cromwell’s Castle guards the narrow sea passage between the islands of Tresco and Bryher. This was an odd kind of project, as all the route research was completed before there was any talk about producing a guidebook! 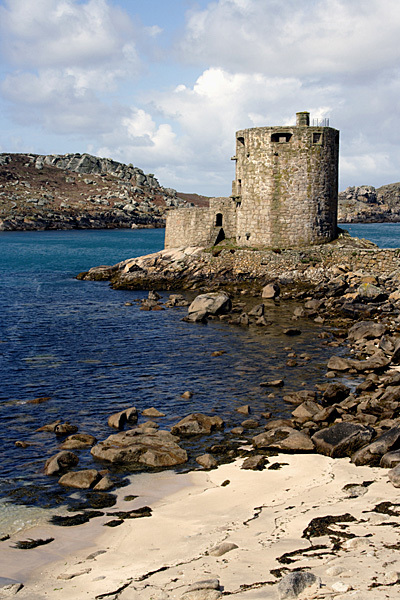 The Isles of Scilly were visited and explored in great detail, which was easy enough as the combined area of the islands is a mere 16 square kilometres (6¼ square miles). Notes were gathered for a series of route descriptions in Country Walking magazine, but plenty more material was gathered than was actually needed. Almost every morning started with a ferry trip, followed by a thorough exploration of each island in turn. In addition there were interesting cruises out to sea to spot wildlife, or simply admire the scenery. Shortly after the trip, Cicerone pointed out that they didn't have a guidebook covering the Isles of Scilly, and expressed a wish to add one to their list. The complete manuscript was delivered in a fortnight... words, pictures, maps, the lot... even before a contract was issued! The islands are a joy to explore, being almost sub-tropical and stunningly beautiful. They get more sunshine hours than anywhere else in Britain, and abound in charm and interest. The book includes a town trail, ten other walks on the islands, and four boat trips. There is enough in the book to last a keen walker for two weeks, despite the limited area of the island group. The guidebook was later overhauled and republished in full colour, then all the walks were checked yet again for a third edition. The book now incorporates full colour 1:25,000 scale OS Explorer mapping of the islands, with all the walking routes highlighted, along with full colour photographs showing off the best of the islands' scenery. The book is now in its fourth edition.